When I was in Los Angeles, my friend Nichelle gave me this present. She heard about it from another writer. At first I thought, "What in the old ladies gift is this?" Now, I have seen the light. Dying laughing. I could tell from your face that you were like, "What the what?" I knew you'd see the light. It's a pass it on writer's gift. I was at the store recently, the cashmere robes are yummmm...as well! Lenore - A cashmere robe sounds lovely and very warm. got one too, with a fleece cover, and love it ! same reaction when i received it as a present. nine - ha. If I weren't allergic to cats I would have one or two as well. I don't care what anyone says. Cats are awesome. I work part-time at Resto! 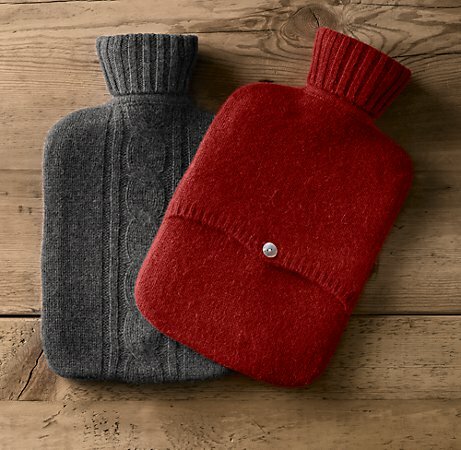 I am glad you are enjoying our water bottles...too bad she did not get you matching cashmere handwarmers also (shameless plug!). LOL! Italianissa - I'm jealous. I love that store. Maybe next time I'm in the States, I will have time to stop by RH.